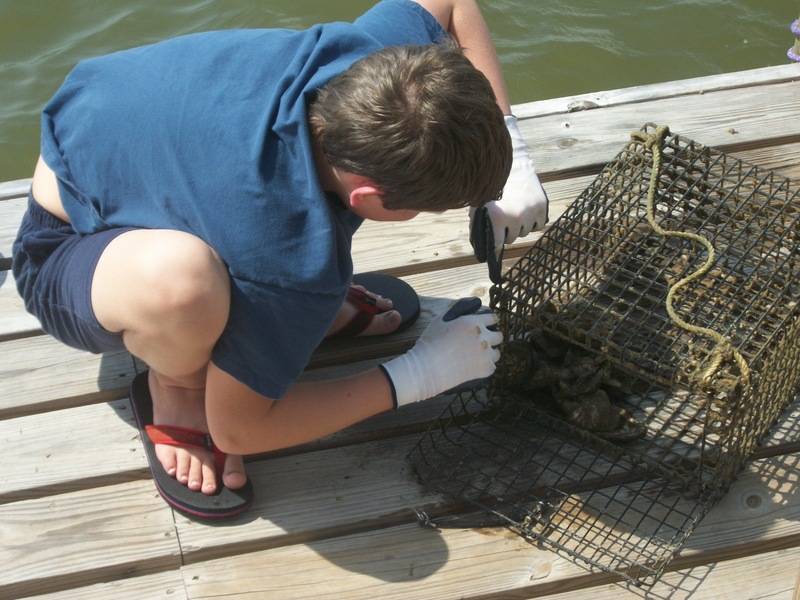 We visited our oyster garden this week. It’s located on CR 1 in MaryAnn Beach area of Baldwin Co. We share oyster cleaning duties with several other families and this was our week. 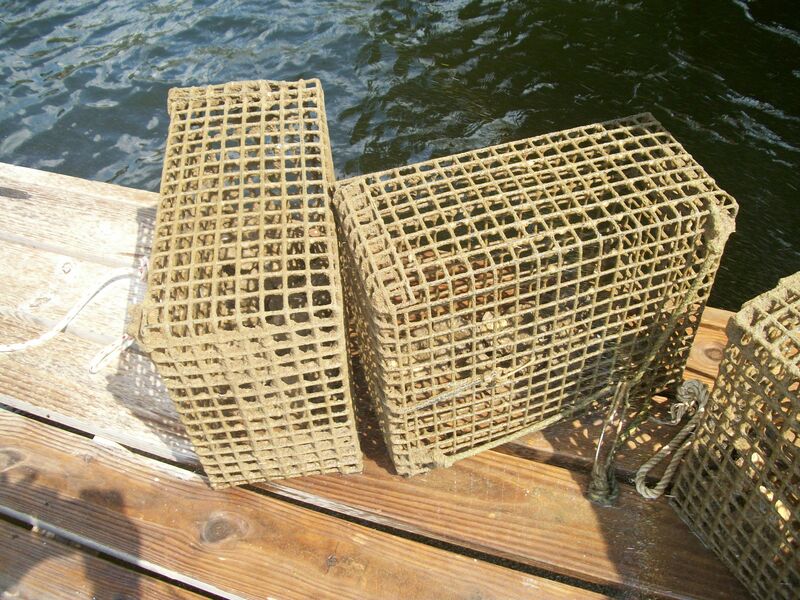 First we pull up the 4 cages, which hang from the pier, from out of the water. They’re usually coated with algae and barnacles, and the cages have been adopted by worms, snails, crabs and some small fish. We have to clean all of this off and out of each cage. So, we hose them down; a kind of power washing. 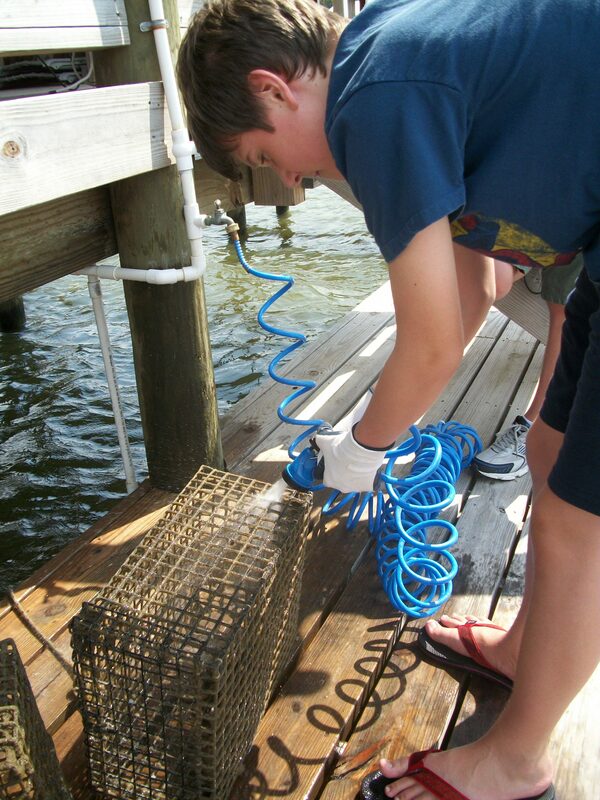 Then we scrub the cages to remove the algae and scrap off the barnacles. This can take a long time and can use a lot of elbow grease. The oysters are removed from the cages and hosed down and scrubbed, too. Then we measure the spat that is growing on each shell in centimeters using calipers. Humorously the calipers have a message printed on them: “oysters rule”. Also during this time, the cages that are cleaned have a chance to sit out in the sun which will dry out the cages, killing the remaining algae and barnacles. We have 50 oyster shells with multiple spat attached. Sometime during the growing season a spat may detach and fall off so we don’t always end up with the original amount of spat we started with. 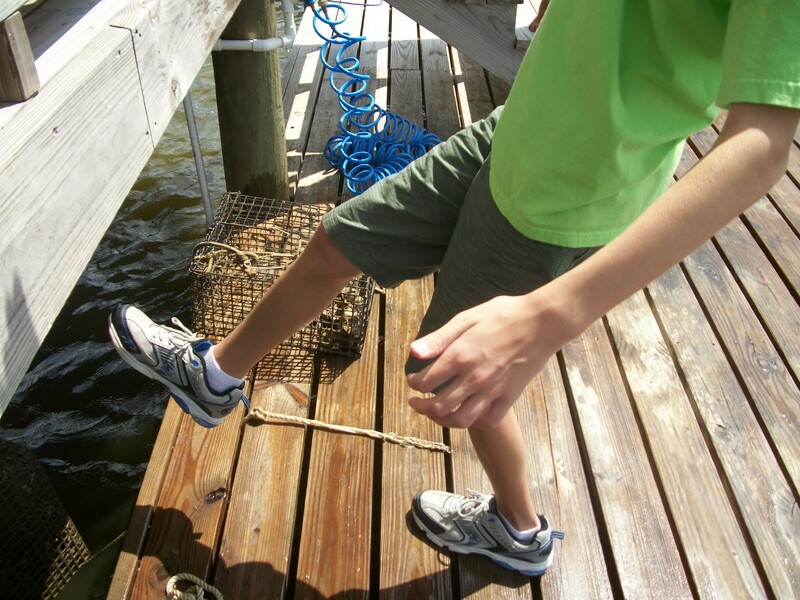 Accidents do happen and once in a while, too, we’ll lose an oyster that slipped through the slats on the pier. We’ve only lost one so far this season. After measuring and recording at least 25 random spat measurements, they go back into their cages which are hooked back up to the lines and tossed or pushed in. The whole process is fun work. It is enjoyable to go back and watch the oysters growing. With the amount of families that we have to help out, we each get 3 trips to the pier. And, with our time being spaced as it is we can really notice the difference in growth. We are not scheduled to go back again until the end of October. 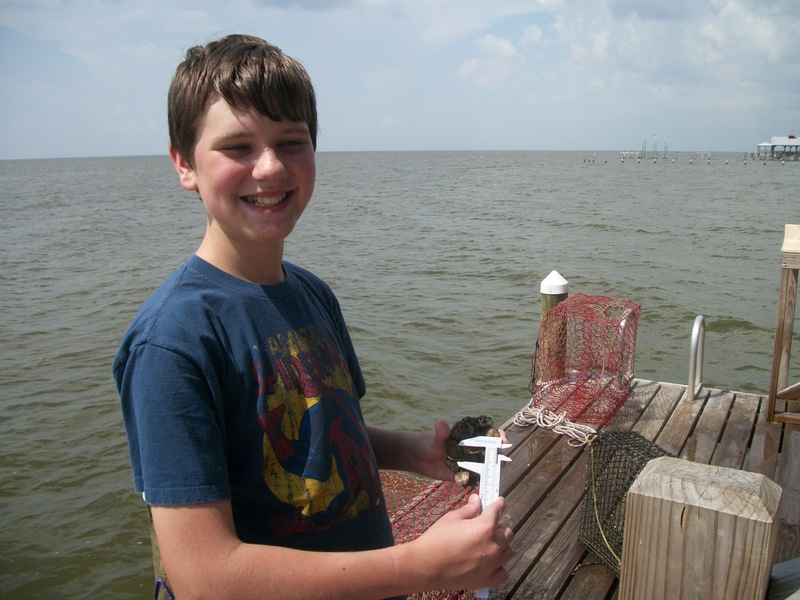 Monthly, we receive a newsletter from the Extension office about the reef restoration project and the oyster gardens. 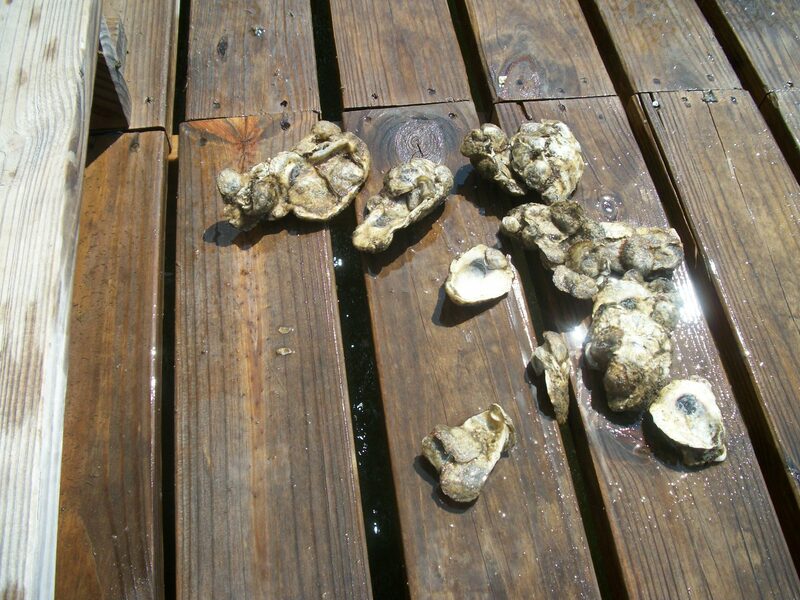 It always contains a chart of how our oysters are doing in comparison to other locations around the Mobile Bay. 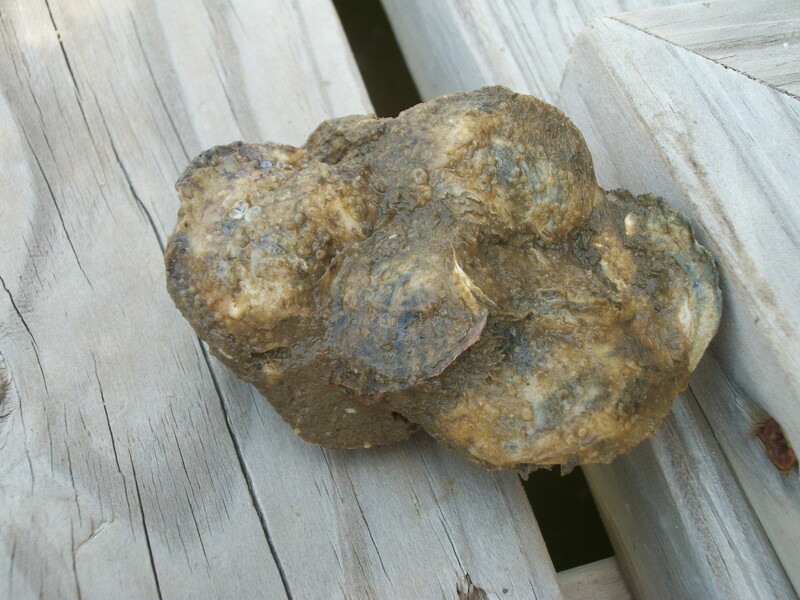 On average, our oysters, along with the other gardeners located on CR 1, are growing rapidly. The boys and I went on a field trip with our homeschool group to the Mobile Transportation Dept. We were going to learn about the tunnels that go under the Mobile Bay. We first learned how the traffic is watched and police and other help is dispatched should there be a vehicle accident or a vehicle in need of help. 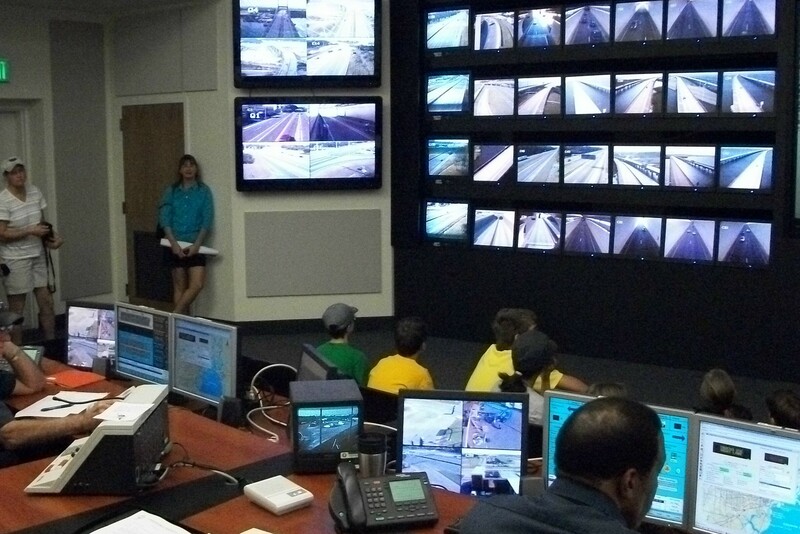 All along most of the Mobile highway system are traffic cameras watching cars and trucks come and go. There are a lot of screens and we did see a car in trouble coming off I-10 at an exit. It was being followed by a traffic assistance truck. 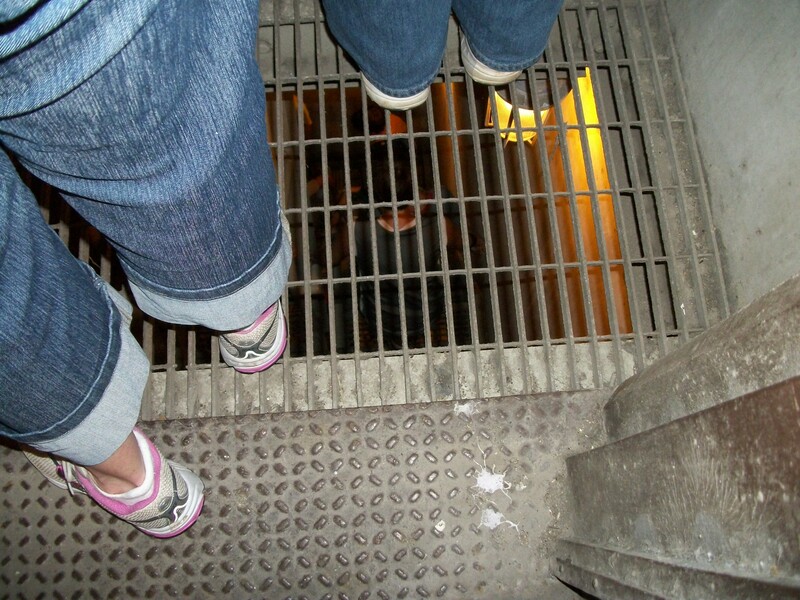 After a trip to another building we climbed down several flights of grated, see-through, steep stairs to get underneath the tunnel that goes under the Bay. 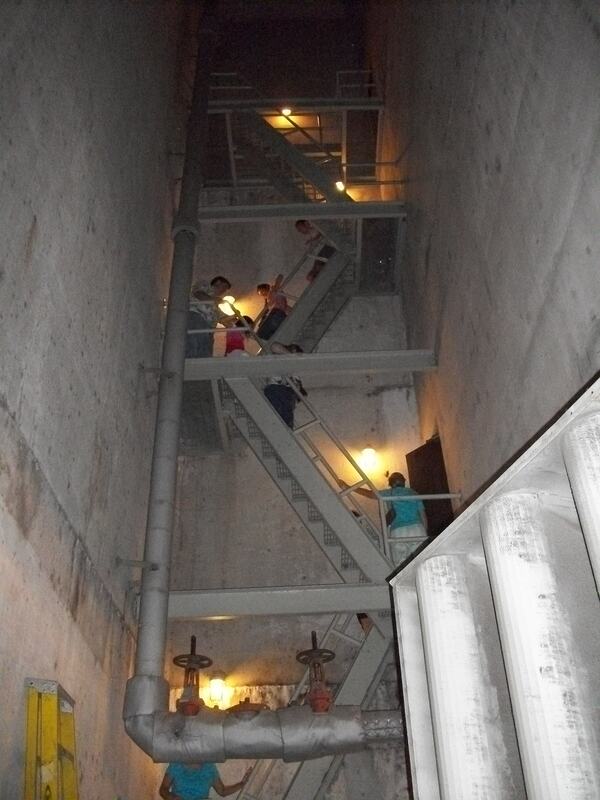 Climbing down multiple flights of a see-through staircase. Half-way down, one of the dads held open the door to the road. Cars screamed by only a few feet away inside their tunnel. The stairway was completely scarey. I don’t do well with heights, but the kids were way ahead of me and I really wanted to see where we were going. Arriving at the bottom we headed through a series of doors and to a space, maybe 7 feet high, that runs underneath the cars in the tunnel. Huge fans keep the air flowing and the tunnel above well ventilated. 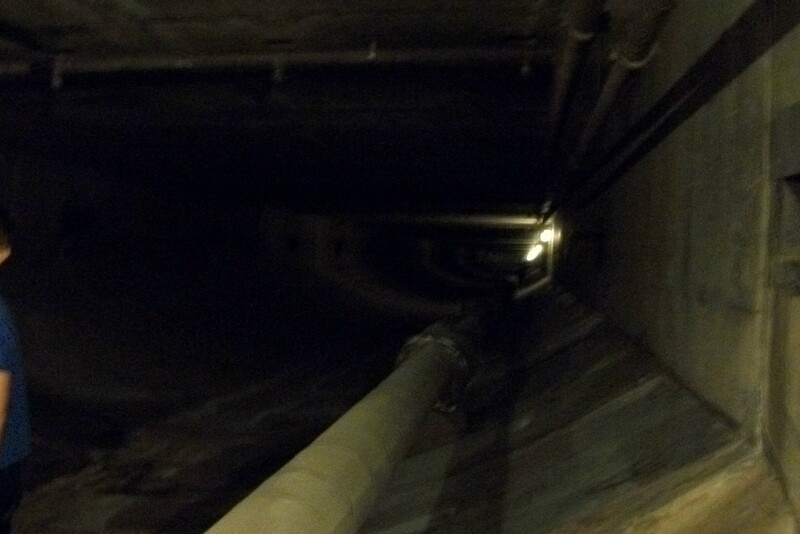 The space spanned from one end of the tunnel to the other. We stayed at that one end for the kids to enjoy the fact that they were under the bay. A little known facts I learned: the top of the Wallace Tunnel is 55 feet below sea level and ship clearance over the tunnel can be about a foot. Not much room to error. Climbing back up the step was much better. That was truly an awesome fieldtrip. If you get the chance to go, ask for Felix as your tour guide. Blue Buttons are washing up on the Gulf Shores beaches this weekend. The are related somewhat to Portugese man-o-war as they are in the class Hydrozoa and phylum Cnidaria. They are so cool and on my list of things to find on the beach and add to my collection. Since I probably won’t get to the beach this week, a friend of mine is bringing me some. Blue Buttons have a small disk-like float surrounded by tentacles. They float on the water and capture zooids in their tentacles and feed off of them. They are not jellyfish (very distantly related through their phylum), but their tentacles may cause irritation to some people. Be cautious but I say “may cause irritation” because some people are not bothered by it. I had been on a 4H trip with my children and the marine biologist with us explained that a certain jellyfish we were looking at was safe to touch; only rarely did some people get a small irritation. I witnessed then a child become irritated and rashed by the jelly; no one else in the group touching it did. Relatives of Blue Buttons that I do have in my collection include: Portuguese Man-o-War and By-the-wind Sailors. These I found on the east coast of Florida (Singer Island) late November. They tend to beach themselves in the winter months. Be careful if you see them. Their tentacles, which can be as long as 150 feet, can still sting you and it’s very painful. Meat tenderizer, urine or an Urgent Care facility can treat the pain. Speaking of blue-ish marine creatures that float, I also have in my collection several Purple Sea Snails. I thought I’d never find one so I bought a shell while in Sanibel a couple years ago. A few months later, visiting my in-laws on Singer Island in November, we found dozens of them washed up. Purple Sea Snails are not related to Blue Buttons, Portuguese Man-o-War or By-the-wind Sailors; they prey upon and eat them. Yup, these three stinging, tentacled beauties have to watch out for a little snail. Purple Sea Snails float in the Atlantic and Gulf of Mexico by making a mucous bubble that keeps them boyant. When they find any of these three hydrozoans, they attach themselves and eat away. When the meal is over they’ll make another mucous bubble and float around again. I’m looking forward to our trip to Singer Island this year and I can’t wait to examine the Blue Button my friend brings me. I’ll add a picture to this article as soon as I can. Today was International Coastal Cleanup Day. Once again we helped out and chose the same location as last year. I remember 20 people spending a solid 4 hours cleaning the shoreline, the jetty and the parking lot at the marina. Well, this year was different. It took 5 of us 30 minutes to complete the same task. I’m not sure people in general were neater this year but we did have our shoreline surrounded by boom because of the oil spilling into the Gulf this summer. The whole coast line from Orange Beach up into the Mobile Bay, then around and down the other side to the Mississippi/Alabama state line was protected from oil and trash floating in the water. There wasn’t much boating activity either and hardly a storm to push the trash inland. What a difference from last year. I’m always happy to help on this day but the oil spill caused a bunch of things to change. No one was cleaning on the beachs, I’m told, and the opportunities to clean in Fairhope included city parks and playgrounds which have no coast, and street walkways which have no coast. My husband walks the dog religiously around 6am. I’m too tired to go but I’m working on it. Maybe tomorrow. August 25th they started spotting deer in the neighborhood. It’s one deer only, usually by the Fly Creek woods. The sun has dramatically moved southward. My house faces due east. My floor is tile and I can measure the angle of the sun along the lines. Aug 25 at 8am it came in at exactly straight down the line of tile. I don’t know what that means but I’ll measure it again later to see the angle that it’s changed. The end of August I noticed the cedar trees were turning a grey/green color. They’re now brownish. Early August the pine needles fell like crazy but have slowed down. Still you can sit at my back patio table and get pelted with needles. I just bought a new umbrella. We’re safe now until the pine cones start falling. I think they might have already. I woke up to a bang on the roof two nights ago. That would be the only thing to make that noise. Aug 26 at the Eastern Shore Center it looked like Fall; the Poplars were browning and mostly bare. The Poplars on my street have been slowing browning all summer but the leaves are now dropping. However, a few are still fresh green. Sept 6: I heard a cool bird sound and went exploring up the street (the undeveloped one with woods on either side) with my dog. I spotted him but with the shadows I couldn’t identify it. I made a sound I couldn’t figure out either when I went to http://www.enature.com. Usually I can get an ID. Anyway, while hunting for the bird, a deer came out of the woods, crossed the street and stood staring at us. We stopped and stared back. It starting walking toward us but before it got too close we walked off. I was afraid the dog would try to go after it. She’s a Lab. First sign of love bugs: Sept 11, 2010 in Summerdale. I saw some more the next day at my house. Did they follow me? I can’t stand these bugs, especially when they follow us into the house. But on the bright side they are slow and easy to catch and squash. 9/15/10: Gary and the dog spotted 4 deer at 6am across the street. They spotted him and darted into our yard, hiding in the trees and watching him as he walked up the street. When he passed them, he watched as they slowly walked out of the woods in our yard and, keeping their eyes on him, walked slowly across the street into the wooded area there. I have a hummingbird feeder up. I saw one the other day. They’re not used to coming in the yard because I got my feeder up too late last year to attract them. We now have a red patio umbrella, too, so hopefully the red will attract them to the yard. We have all kinds of hummers migrating through here. I read we are not just a north/south migration flyway, but also an east/west flyway for hummers so we get a great variety. I saw about 10 at a neighbor’s feeder the other day fighting for their territory. They are so fun to watch. Hummer banding is in October at Ft Morgan. I’m going to make it this year. Last year we went for the bird banding and I got to release a banded bird. Way cool. Out of the blue a friend started telling me she had just learned that if you mix red pepper flakes in with your bird seed, the squirrels will go away. Apparently red pepper flakes don’t affect birds but the squirrels hate them. She had no idea I was having squirrel issues; she’s a new friend. So I went home and tried it. I have a tube-shaped feeder with a cage around it. The little acrobats hang on the cage and scoop seed out of the bottom openings. So I mixed in a handful of red pepper flakes, walked into the house and watched. The first hungry squirrel ate and ate and then I saw it shake its head like it was crazy and hop away. Cool! But (and there’s always a “but”), it came back and resumed it’s meal. Again, shaking its head and hopping off. The little guy kept at it though and emptied my feeder by flicking it all to the ground. Then it picked through the pile in the grass and kept eating. Maybe my pepper flakes aren’t hot enough. Or maybe both of us were misled. If it’s worked for you, or if you have any other tricks, let me know.